Within 3 days of my last post, I finished this long-term dream yarn. The project started back in February 2017 when I called the merino/silk spin Favourite Places. Soaked, and dried flat on a towel the stash is enriched by around 1,209 yards of laceweight handspun zephyr (merino/silk) yarn. Each skein has a tie-tag (I wrap in clear tape; nothing fancy) that notes the first end. Place-keeping helps with a gentle gradient! This was my initial Knit Knack blog post on the spin with its backstory. Then Team Spindlers saw a lot of the project in our 2017 Tour de Fleece. With the uplift of shared spinning, I had 850 yards spun by the end of that TdF. The sweep of Tour spins is in this Flickr album where I parked a set of images. You will probably knit like crazy for a while, get tired, put the project away for awhile and then pick it back up. Your memory will not be enough. Notes help you remember where you were. The project notes say that it was a year post-TdF to get the 4th, final 32 g 2-ply ball. Other fibre work including spindle spins took up the time & I basically did not like running out of this fibre! The last spun cops combined for a 32 g plying ball just this big. 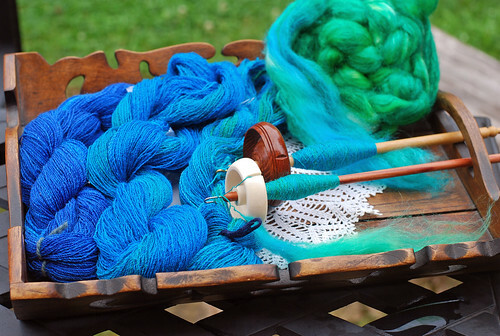 Often I hear questions about joining for larger skeins when using spindles. Well, I don’t. What you see here is the 2nd largest skein of this particular project: it is 359 yards strong. September 30, 2018 – 32 g = 359 yards. All plying done on Peruvian medium turned pushka (see the last TKK post for a plying pic). The yarn is around 4,836 yards per pound. 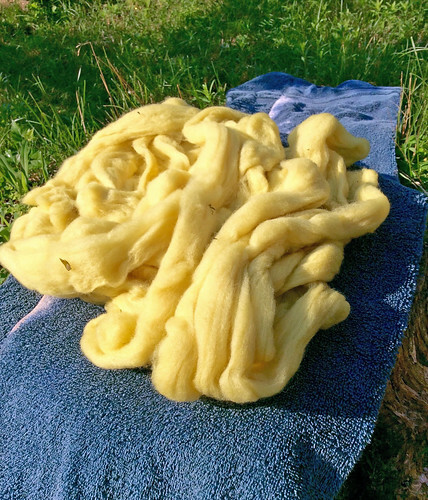 Millspun zephyr (18/2 wool/silk) is 5,040 yards per pound. 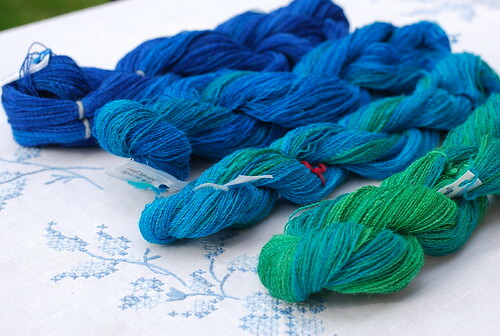 Knitters can get 56 g/ 630 yards of zephyr millspun. My handspun skeins here are lower yardage-wise but it is no bother for me knitting lace. Yarn check! What to make now? It’s a good question. Ever since the braid hit my hands, I have seen a new knitted lace shawl. Not wanting to get lost in hubris here, I am taking deep breaths for clarity. The current idea is to place green at the top of a semi-circle. The Sarah Don spider pattern shawl is beautiful, and a version is in Jane Sowerby’s “Victorian Lace Today” that I know & trust. Ravelry project knitters are both thrilled with their FOs and flag the difficult start. It means flipping the spinning order backwards for the purpose of knitting. Can I? Yes (take that brain plasticity)! Should I? Decision pending! As for my yarn’s backstory, Mandie of Sheepy Time Knits has seen my skein pictures. She has all the gratitude – I did the thing we talked about! After 3 years, 10 months of working my way up to the spindles it’s finished dream yarn. 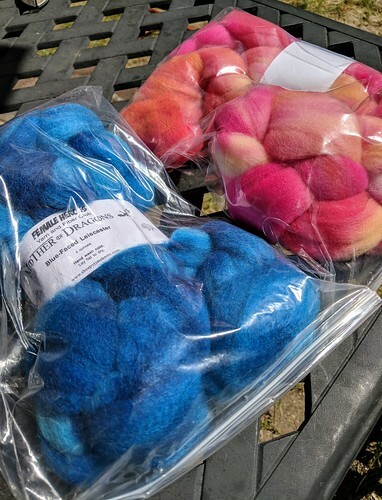 Categories: Spinning, Stash in; Stash out, Tour de Fleece | Tags: drop spindle, finishing yarn, handspun yarn, merino silk, Ravelry | Permalink. We’re fresh-off our Canadian Thanksgiving, which started a little early with my impulse to bake a cranberry/ blueberry crisp and finished with our first turkey dinner at home. 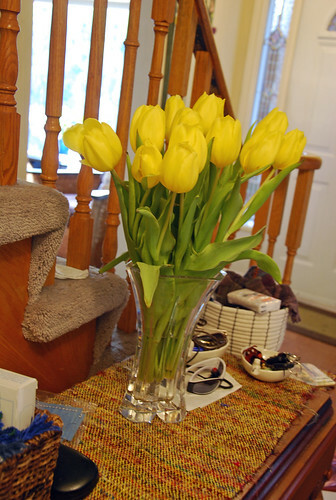 T-kiddo made a good choice on the supermarket cut tulips… they are still fresh & brightening the table runner that I wove in spring 2014, sari silk on 5/2 mercerized cotton warp. The weft is Himalaya Tibet recycled silk, a long-ago gift that could keep giving – the 14″ x 42″ runner used only approx 80 yards. As weavers can tell from the I Wove This pic a lot of learning was going on at the time. Up to & including confusion when tying up my treadles for plain weave that worked in my favour. Our front hall has its 2 handwoven table runners now, and this is the cheery one of the pair. Thanksgiving being just this past Monday is hard to believe. We ran right into an energy audit + furnace replacement job, and handspun yarn has been heavily on my mind! We are at a 4th handspun knit casted-on since mid-September. That is more than usual & 3 are ready for sharing on TKK. The quartet has 2 things in common – smaller-scale projects; and all existing stash. They are a slice of how leaps in spinning can & do become finished objects. At the centre is this truth – my handspun was not always flowing into queued projects. 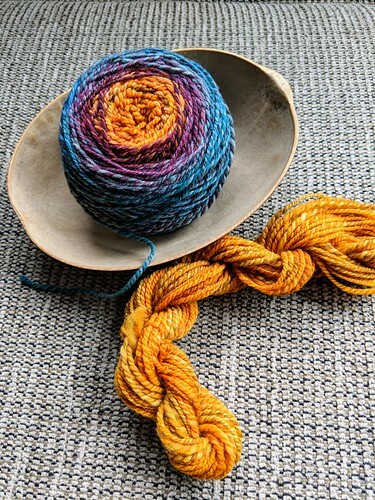 This is an almost constant concern in spinning spaces: how do you use your handspun yarns? In these 3 projects today the work is a lattice & not linear. This Lacymmetry by Naomi Parkhurst is 1-day into its progress. It is making me very happy. This BFL/silk yarn is another 2014 story. 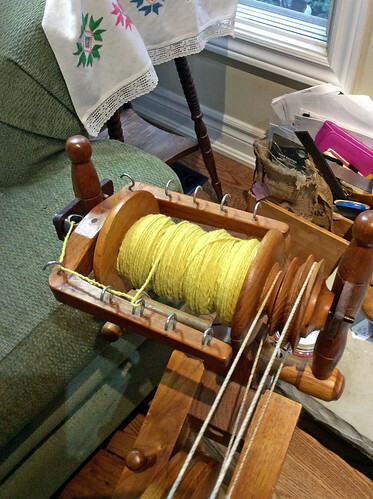 In mid-July that year, I used my 127 g of fibre to spin with the newly acquired William MacDonald antique spinning wheel. 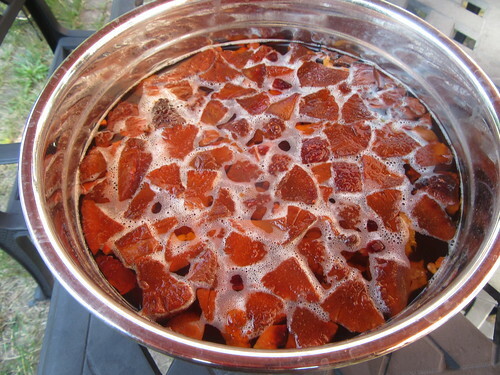 It is 646 yards that I used in a first madder dye experiment later that year. The burnt orange colour was an improvement but what to use it for? Until Naomi’s release this week I was fairly stumped. The suggested yarn is one I know well, Valley Yarns 2/14 alpaca/silk. My BFL/silk is a pretty good fit, and with that plugged I had to start right away! Takeaway – you will see curated pattern lists for spinners but keeping eyes forward on new releases lets you find your own gems. This designer also spins, and that right fit for handspun is an excitement she knows well. Hold the front page – spindle-spun socks! Before the shawl answer fell into my lap, I started a new pair of socks this month. It is with my most viewed spinning project the Pyrenees Delight Cheviot yarn. The 1,529 views; 26 favorites came after being featured in Ravelry after the 2017 Tour de Fleece. The 650 yards of 2-ply is not that old at a January 2018 finish. It was a puzzle though… would I split to get the socks I had dreamed about while spinning or should I use all in a weaving project? Here’s my current answer & sock knitting guide. When swatching the Cheviot, I knitted lots and measured twice. The 2.25 mm needle gave a good fabric, 9 stitches per 1″ in stockinette around. The guide is Lara Neel’s excellent “Sock Architecture, 2014. I chose her Strie for its garter rib pattern with my lighter 2-ply. It is going well up to the heel now. This z-plied yarn is untwisting a bit as I work & I may cross the foot stitches for firmness. The Handspun Treasures book has a highly entertaining & inspiring juried group of handspun projects. I snagged my copy on a trip to the Strand bookstore in NYC. This Calorimetry headband in Targhee was a 2-day knit of joy. In this second selfie view you can see the hint of its Corgi Hill Farm gradient, Inverness, properly. Using a single clay button, I have a 21″ long Calorimetry. It is my 2nd version in handspun. Working 1×1 ribbing helped cinching in areas with thinner yarn. This was from a 2015 fall spinalong in the Wee Peggy spinners group on Ravelry that went fairly quickly. The blues went to N as a pair of plain mittens this winter. 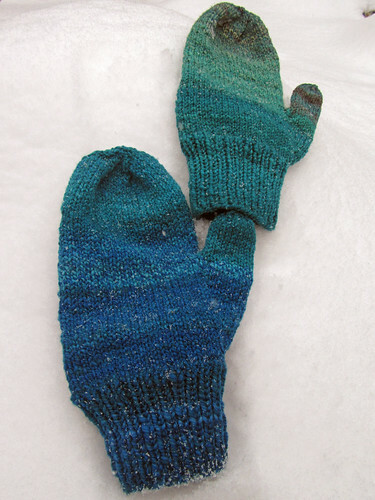 The pattern guide was Knit Mitts by Kate Atherley, 2017 & used approx 170 yards of the blue. This is what I kept around since February waiting for inspiration. It wanted to be a headband! The orange is still on the couch waiting for the hat-trick. Takeaway – gradients are not set in stone. The 390 yards has made 2 people happy so far, and I am not sore about giving half to N for mittens. As I am this close to finishing my 4 ounces of merino/silk with this medium Andean pushka, I have thought of a lace shawl. Which lace shawl will depend on my bandwidth & how much yarn we have here. … without having planned beforehand what you are going to do with the yarn. Knowing how to do forward planning is important, I agree. If like me ‘what ifs’, new tools, techniques beckon & good yarn results then you can still move forward. Sometimes frustration kicks in, of course. More often you go in a latticework of time spent on the project instead of the good old bossy line. A side benefit has been letting new skills like weaving catch-up to those good yarns that I still love to spin. Just think of it as a long run up to the crease (cricket term & to mix metaphors oops)! Categories: Finished & in the wide world, Getting the knack, Holidays Happen, In the Pipeline, Stash in; Stash out | Tags: BFL/silk, Cheviot wool, drop spindle, Flora, handspun yarn, headband, Mittens, Sock, Spinning, Targhee wool, triangle shawl | Permalink. 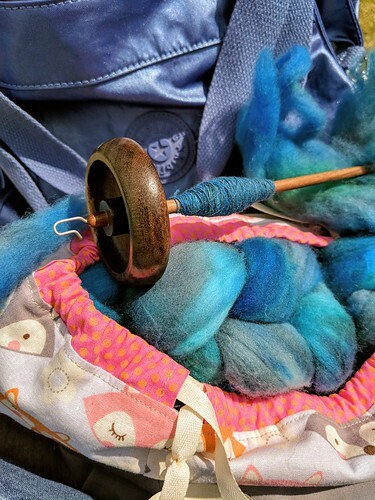 The creative forces at Sheepy Time Knits have been keeping my spinning & knitting life very happy in one way or another since I first put together that Mandie is a dyer when we met at Stringtopia these many years ago. You may have noticed that they come up a lot on TKK, and never in a bad way. When sign-ups for their 2018 brand-new Female Heroes Club opened the happy experiences made it fairly easy to think through. This time I swallowed the fear of over-stashing fibre and joined on that side of the club. Reorders sing from the same songbook. This can’t be easy to execute for an indie dye business but execute it they do. This club round-up is my simple appreciation. But wait, are there backroom happenings? No. I am sharing something that has been consistently good, period. 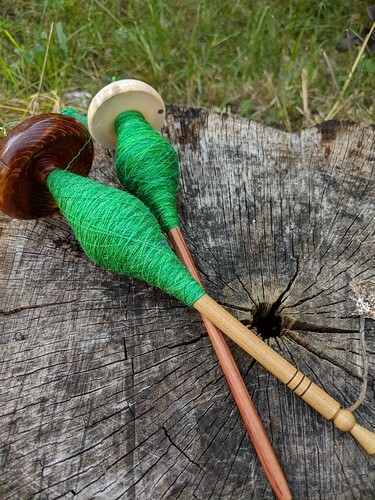 One ply ball is 35 g, and I last wound-off the Jenkins Lark spindle on in mid-May, 2018. The 2 Turkish-style spindles are grabbed alternately each time I head out the door. It’s a slower but still steady way of spinning a project. A quick 2-ply that I spun as a fractal on the Watson Martha spinning wheel over 10 days in April. The yarn was spun and plied in double drive, and the second braid is a dead ringer for the first. As a big fan of Targhee, I was impressed with this fibre in particular. It was open, fluffy, and a joy to spin. The 635 yards of 2-ply is lovely (2,540 yards per pound) and so soft. Imagine my squeal when this came in the mail. One good BFL spin has deserved another. Again this went on the Watson Martha in double drive but this time I wanted a 3-ply yarn. They are in the DK-weight range, and with the re-order, I now have approximately 394 yards (787 yards per pound). The second braid was my ah, we are home again 2-day blitz spin. It may have been a little Mad Max to start this while also plying the beautiful Mother of Dragons. This will be a conventional 3-ply yarn, and I am looking forward to seeing it off the wheels. The Wee Peggy is in Scotch Tension spinning a light 5:1. It’s been very, very relaxing with an audiobook after long days. Spinning is in-between other projects – I have finished T’s colourwork sweater & am spending other nights weaving a band in my backstrap loom. There are loose ideas for how I will use the handspun but for now I make the yarn. The trip was very good for my focus, and I am happy to be working again. Categories: Finished & in the wide world, Spinning, Stash in; Stash out, What I'm up to | Tags: BFL wool, drop spindle, handspun yarn, Masham wool, Shetland wool, Targhee wool | Permalink. The August challenge theme in Spindlers group on Ravelry is “fantasy,” and I took the plunge! Not going with Outlander, read ahead! This 5 oz braid of combed top from Corgi Hill Farm is in my favourite blend, alpaca/merino/silk. The spindle choice is my 22 g Spanish Peacock spindle, Flame Box Elder. 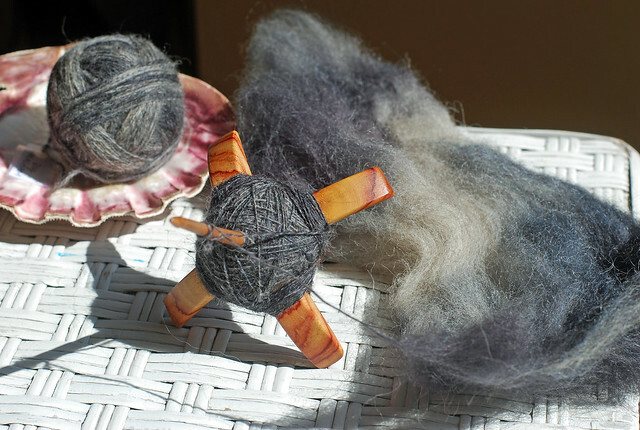 The group challenge is to spin at least 1 or more oz (or ½ oz lace) during the month on spindles (of course! ), posting a skein in the thread by EST end of August. The fibre brought to mind a single thought – Gandalf’s Eagle! I went for our illustrated (Alan Lee) copy of “The Hobbit” by J.R.R. Tolkien, found page 108, and headed for the passage that took my breath away so many years ago. Letting the curious Lord of the Eagles of the Misty Mountains take me out of my tree perch sounds like a good way to crack through that oh-so-pragmatic decision to miss the Tour de Fleece this year. So far, I am the only fantasy Eagle Lord entrant but the past 2 days have brought some wonderful interpretations into this month’s theme. Join us or just lurk for the fun, will you? This past camp week for T was also a treat for my fibre projects. 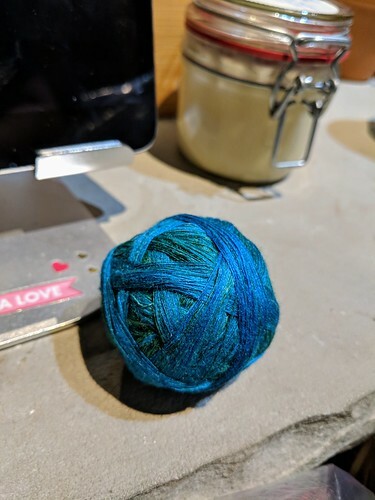 Wrinkles aside (I answered their survey this morning…), I used the daytime hours to have the coveted dye day, spin for the fun of it, share online, and best of all open the floor loom! Yesterday brought a new tool into the kit – first pair of eye-glasses. Slight correction later, and I am far more comfortable on-screen. The 5/2 cotton threads on the loom are much easier to work with now, phew! Another week of camp will start after our civic holiday weekend. I am looking forward to sharing the pictures/project stories with you! Categories: In the Pipeline, Spinning, What I'm up to | Tags: alpaca/merino/silk fibre, drop spindle, Flora, Spinning | Permalink. This week, I answered a question about spindles – what if any pause is there between spinning singles (first elements) & plying. It’s a great question! The original Q&A is in the Ravelry group, Spindlers in the decade-old Stupid Questions thread (post no. 8,515 starts) if you want to check it out. You can imagine my jar in its usual home of our fireplace mantle. There are 5 singles balls of Targhee, the bright blue in this jar that are an example of a 2018 work-flow with a single spindle. My last TKK post had this project’s 6th cop shown on a park bench. Let’s go back to the beginning, a very happy mail day in January. A wonderful ending to a long & at times frustrating search was being quietly offered this good-as-new Bosworth skinny Midi 22 g spindle in Blue Mahoe. Thank you, kind Raveler! When I decided to add a second wood-whorl Bosworth it had to be one of their Blue Mahoes. This tree, Hibiscus elatus is indigenous to Jamaica, is our national tree, and we planted one at our childhood home. No top is being weighed and parceled out. I am just spinning by feel – when my hands feel a difference in the spin, I wind-off. The how is by balancing the spindle in a shoe-box, pushing it away, and winding myself a ball. Using a single spindle for a longer-term project takes an important bundle of skills. It means managing those singles tangle-free over time. Developing different paths from a full spindle to re-filling the spindle to completion is a personal journey. It boils down to achieving consistency. Here, I kept my options fairly open with separate singles balls. After lunging to start, I pretty much had to. Besides, winter is not my best planning time. The current idea is to move towards a 3-ply yarn when I am finished with singles. The yarn is under tension, all in one spot, dust/pest-free, and encourages me to keep going. The outside of each ball is the first-spun of that batch. You can even change that if you please. One point in my answer this week was that it’s worth noting our whole process. All of the singles in my jar have been “resting” – some all year. When I get to the last of this fibre it will get some “rest” too, typically overnight. When I get to the plying steps – there will be more than 1 skein for sure – is anybody’s guess. I can pace that too as the boss of my own yarn! Categories: In the Pipeline, Spinning, Things Jamaican | Tags: drop spindle, Equipment, Spinning, Targhee wool | Permalink. Early Sunday morning, I took a knife to some of the stored avocado pits. It was a way to think of my spinning friend Mary before her memorial service that day. The bowl includes 4 pits from Jamaican avocado pears brought by my Mother-in-law – they gave colour instantly! It’s no rush, and is just a moveable feast around the backyard as I seek the sun. 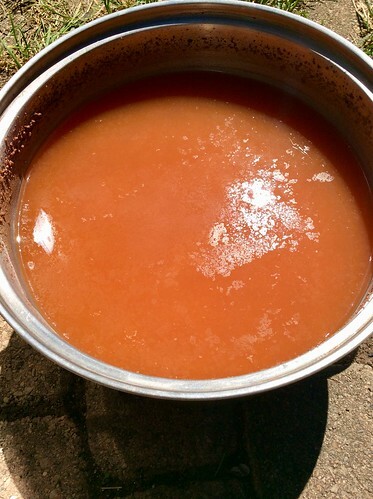 This is after 1 boil, and cooling on Tuesday morning. While it sits, I am debating using ammonia again to boost extraction. 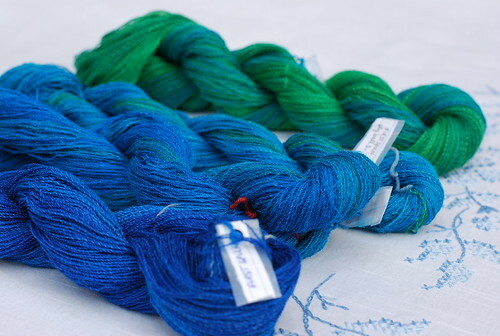 Slated for the dye-pot is this approximately 285 yards from 100 g of roving from Hopeful Shetlands. I carded the roving before spinning. The rolags hit the CPW at a good clip in the month after our houseguests left. 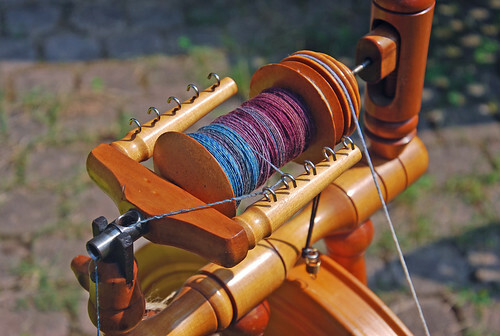 It is spun supported long-draw, and plied on my Watson Martha also in double-drive. 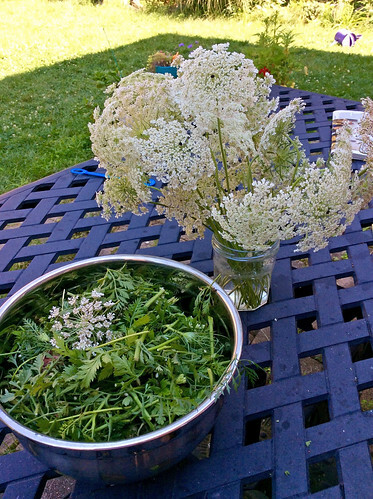 We took a walk last Emancipation Day to gather Queen Anne’s Lace. T was game, and now understands about dye-plants. We gathered 204 g in a local ravine. I might have been more into this than young T-ster. 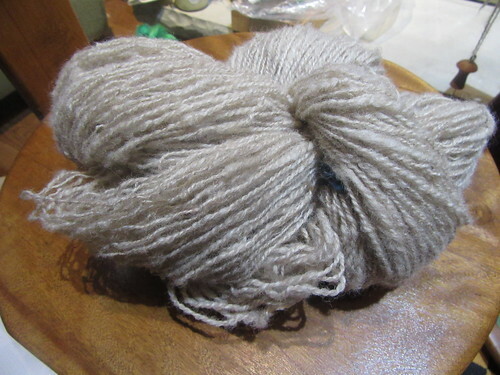 The target was 98 g of Saskatchewan Targhee wool top from Sheepspot. Mordanting with alum & cream of tartar is where T lost a good deal of interest. Luckily, Mom was on hand to keep him occupied. After a first boil, I got 145 g of carrot tops from the supermarket, and added them for a 30 min boil. The wool cooled in the pot overnight. By the notes taken, I had approximately 173 yards of 3-ply by the end of that week! It was spun and plied in double-drive on my Watson Martha. It is a 690 yards per pound yarn. That would be in an aran-weight range but the wraps per inch is 12 or worsted-weight range. There are subtle changes for the TKK blog appearance, and I also re-worked the About page. The break that I have taken this year from the Tour de Fleece is as much for focusing at home as it is for this re-tooling. The memorial for our friend, Mary, was small but very touching. I went with our “not a teaching group” friend, Nancy, and other spinners were able to join as well. On Sunday night, I started a new 3-ply project on the Martha spinning wheel. It was Mary’s custom wheel before she surprised me with her offer to sell. I hope that her family knows how much her spinning life’s work mattered in the community. Categories: Natural Dyes, Spinning, Stash in; Stash out | Tags: avocado dye, drop spindle, Flora, handspun yarn, Ontario, Queen Anne's Lace dye, Targhee wool, Watson Martha spinning wheel | Permalink. The weaving that I mentioned in the last post is all pressed with pictures pending. I can’t wait to go through the shots and share them with you! We are in a 4-day family break for Easter, and this is a short (yes, really – I know I can make it so) post. Potted at least until we thaw. Best wishes if you celebrate the season! 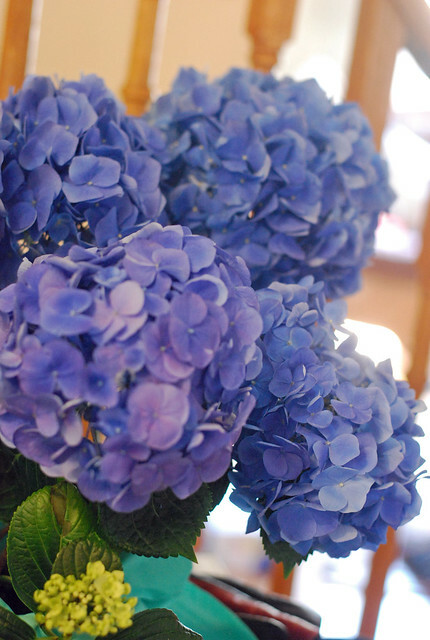 The hydrangea has brightened the hall since Thursday afternoon as we managed through several pressures of the week. Little did I know when rushing about preparing on Thursday that we had a beautiful surprise from my dear Mother-in-Law waiting at home. The front bloom is faded now but the scent is still strong. Many of our family’s additional needs surface in the holiday times. School was not exactly helping with T’s big project & other pressures. Luckily neither N nor I is a Blast the Cheery-weeries type. The learning curve is more about how to attune & build-in quiet successes by being fully present. 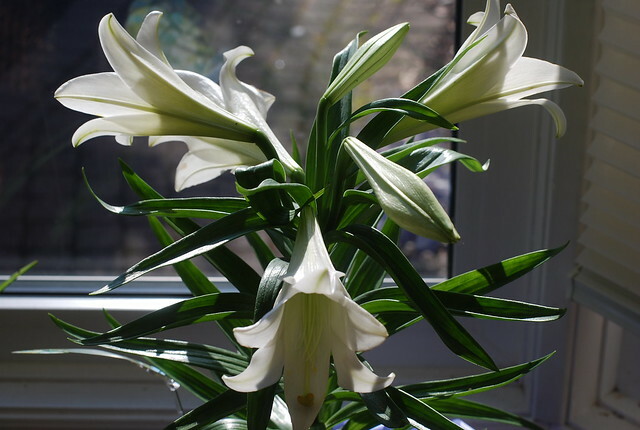 This Easter unfolded as quiet and meaningful even as we do still miss family, and others. By Saturday morning, a day trip was in order. 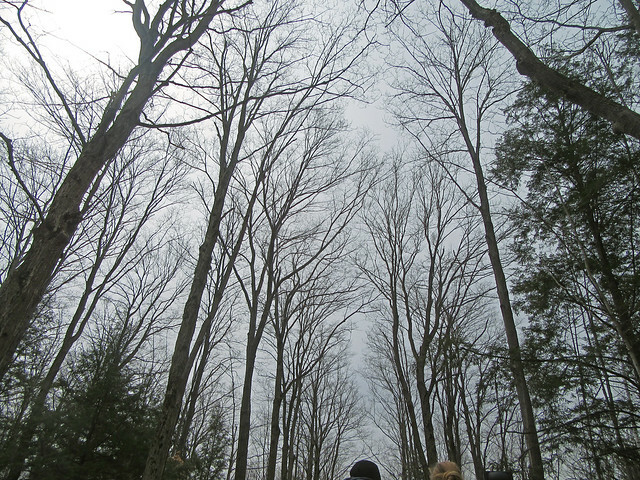 We enjoyed a working sugar bush in all of its glory! 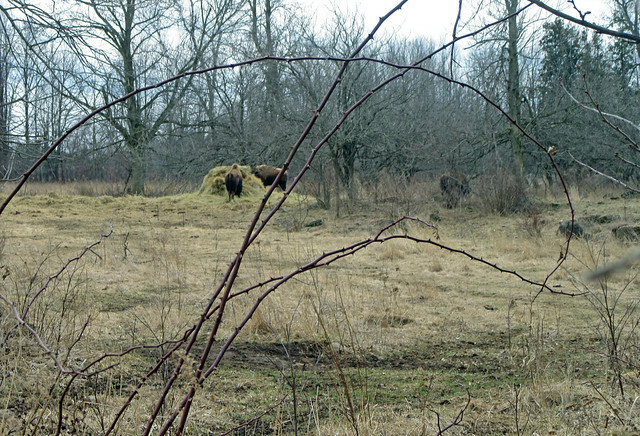 It was the last weekend of their open season, and the Conservation Area was busy with families and many dogs on leads. During the long, chilly wait for our guided wagon ride, I got some spinning done on my Jenkins Lark spindle. Masham wool on my Jenkins Lark! The fibre is Masham wool dyed as “Minerva” by Sheepy Time Knits for her 2018 Female Heroes club. The plying ball in the shell weighs 35 g, and is 2-stranded. As soon as I opened the package it went on this spindle, February 12th. 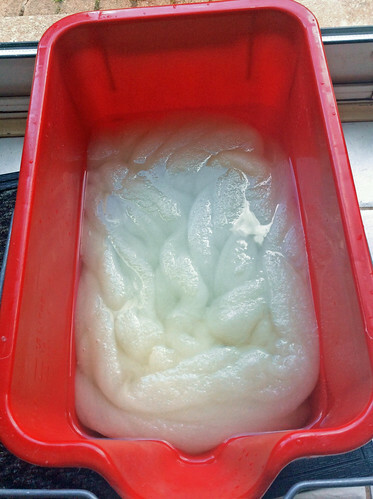 This is my post from 6+ years ago on my first & until now only spinning of dyed Masham top. This spin is just as lovely as I remember, and it has been a good project while watching T at his after-school activity. The Jenkins’ spindles always get loads of questions too. 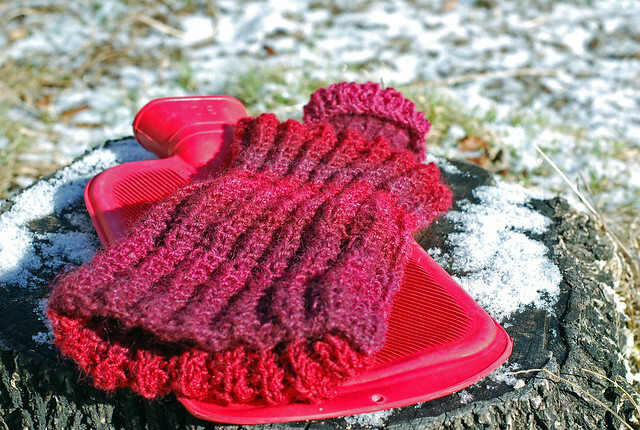 … in January 2016, I used the yarn to knit Sue Blacker’s design for a Hot-Water Bottle Cover. The 4-ounce braid gave 134.5 yards of this 3-ply Masham, and I used a co-ordinating handspun yarn for the flap. I have the seed of a thought that the Minerva Masham may be nice for small weaving but I am not bothered about end-use right now. The wagon was drawn by 2 horses, and it was a very nice guided ride. 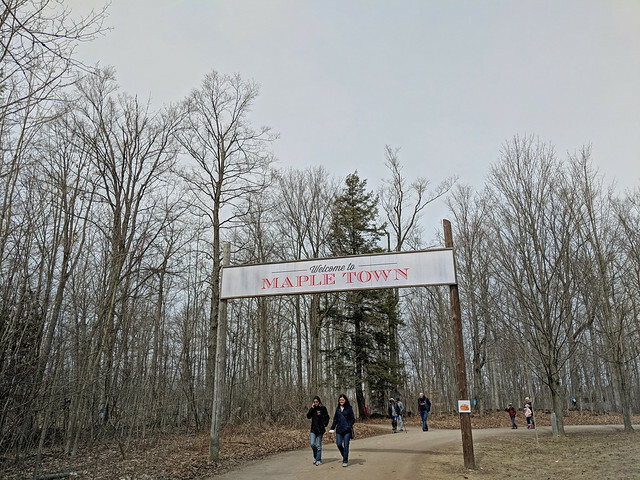 The park has single-tapped 400 sugar maple trees this year. 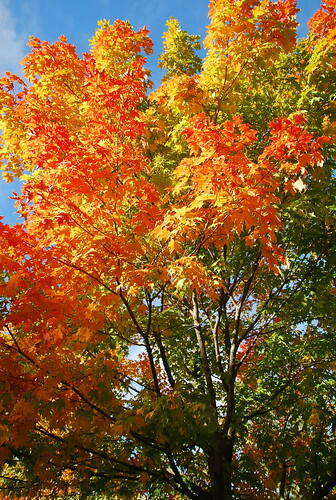 In a less stressed year they will tap up to 600 trees. 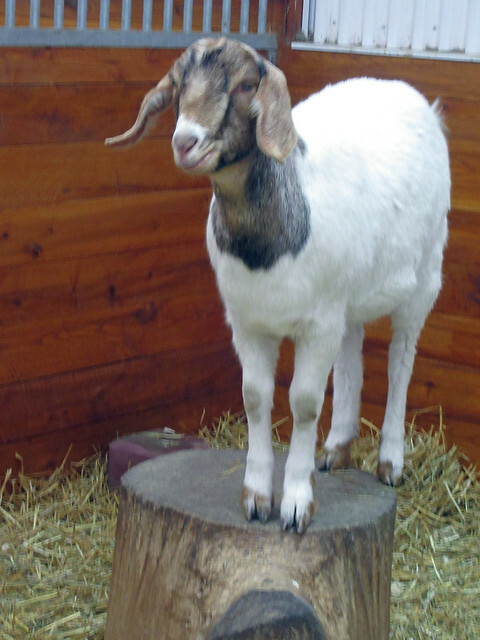 We also enjoyed the Raptor Show but my favourites of the animals were between this Nubian cross goat, and the Bison. Sometimes you just need to silly run down a road to see about some Bison in a field? It was chilly, and that reminds me to share about an awesome spindle-spun hat that I made awhile back, and wear all the time. The day trip really turned things around, and today included a new round of treats (those simple but effective Blizzard ads get us each spring). Categories: Finished & in the wide world, Holidays Happen, Spinning | Tags: drop spindle, Fauna, Flora, hot-water bottle cover, Jenkins Turkish spindle, Masham wool | Permalink.